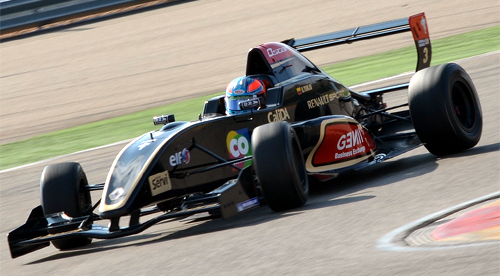 The collective Formula Renault 2.0 Eurocup test days in Paul Ricard took place under various conditions. In the morning of the first day the track was wet. It was Steijn Schothorst who was fastet in the morning - P 1. Tunjo on P 4, Malja on P 26. The afternoon session saw a dry track in the end. With one set of new tyres the Kaufmann Drivers ended up on P 8 - Tunjo, P 17 - Schothorst and P 20 - Malja. On the second day the track was once again wet. The Kaufmann Drivers were always on top of the time sheets. In the morning it was again Steijn Schothorst on P 1. In the afternoon, Tunjo had set the fastest lap time overall. P 1 - Tunjo, P 10 - Schothorst and P 14 Malja. On the first day in the morning some installation laps and function checks were on the schedule. In the afternoon the Kaufmann Drivers had put a new set of tyres to see how the car behaves. Oscar Tunjo was hampered by a red flag sequenze on his new tyre run. Still he was able to get on P 5. Steijn Schothorst and Gustav Malja both had been for the first time on the track. In the end they were on P 19 and P 27. On the second day the Kaufmann Drivers put another new set of tyres in the morning. OScar Tunjo, after having really fast on used tyres wasn´t able to use the new tyres to the maximum. In the end only P 12. Gustav Malja and Steijn Schothorst both had some reliability issues with the car during the run on new tyres and therefore only had been on P 25 and P 29.